The first shall be last, and for this dram, the first will last and last and last. It is the Tao of Laphroaig; ancient wisdom inscribed with a golden pen and crushed diamond ink on the finest vellum, greased with the fat of lambs sacrificed to Zeus to keep it supple. The nose is unmistakably Laphroaig, but creamy, like a pineapple meringue, dipped in ghee, wrapped in Arnold Palmer’s argyle socks, and then smoked in a brier pipe with hazelnuts and Eau de Laphroaig, Coco Chanel’s greatest (and least known) creation. It’s a Caesar salad made with quail eggs, baby flying anchovies, rye bread croutons, and asiago cheese; the whole thing sautéed in rendered bone marrow and cream skimmed from the lovingly caressed udders of Vermont’s finest dairy herds. Et tu, bootay? Heat at the front of the mouth suffuses outwards, somehow violating the partial differential heat equation: but Mother Nature doesn’t mind being controverted in this case. It’s a sin, if sinning was beloved by a merciful (and fun-loving) god. Prickly warming happiness and a glorious oily mouth; not a virgin olive oil, a really slutty olive oil tarted up with garters, paprika, and the white hot passion of a young woman pining for her high school paramour who defriended her on Facebook. It’s Chef Ming Tsai committing East/West nuclear fusion on an orange cross-pollinated with starfruit. It’s a punchy pungent profile writ large in craggy granite, carved—but not battered—by the elements. By the second sip, my mouth has surrendered to the tender mercies of the master blender. The finish is repeatedly running a cedar comb through the raven black hair of…of…hey, you get to pick this one yourself! (My choice is Lisa Edelstein from the show “House”.) Although this is strong medicine for the spirit and soul, it’s not as medicinal as the milepost-marking epic Laphroaig 10, not even if you added lemon juice filtered through pure smoke. It’s a chaotic attractor pulling the smoke into a vortex, swirling it round all over erotically through my sinus system. [Stephen: Bill! You mean, “ergodically”!] No, Stephen, this dram is making sweet, sweet love to my olfactory and pharyngeal systems. 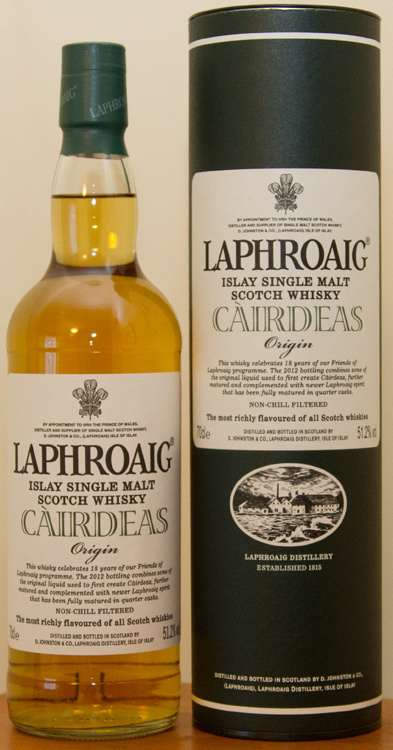 And what would a Laphroaig review be without mention of the peat notes? They poke up in the Càirdeas Origin, like fife-playing piping plovers, like an organic landscape hinted at by a mohair afghan covering a mo’ hairy Afghan. (Am I allowed to write that? It felt so…wrong. How about, “by an Angora afghan covering Dora the Explorer”? Or perhaps “a merino serape swaddling a fino señora“?) You get the idea: Bumps, peaks, valleys, vales, dales, clefts, hollows, crags, and the rolling, rolling waves of the ocean. The Laphroaig Càirdeas Origin is snowboarding through several feet of fresh powder–It’s like, well, actually, it’s impossible to describe, but it should be experienced. Soon. Often. Pray for snow, and pray for Càirdeas (Origin). Our thanks to Simon Brooking and Laphroaig for the sample!